Originally published in 1970 ‘Alice in Acidland – Lewis Carroll Revisited’ was written by the photographer and author Thomas Fensch. 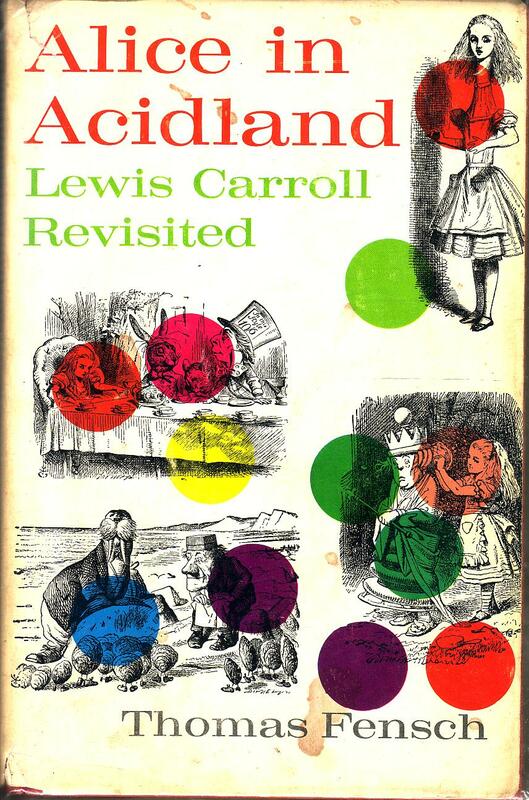 Thomas Fensch opens Alice in Acidland (1970) by postulating what the response to Lewis Carroll’s original Alice’s Adventures in Wonderland (1865) would have been had the book been published in 1970. Aside from the obvious differences in the publishing industry itself, he believes the book would ultimately be read in light of the psychedelic experience by the reviewers and audience. He gives the book a fictional Time magazine review title: “Browsing through the Psychedelicatessen”. After a brief bibliography, the book is reproduced, including annotations by Fensch in the body of the text. Of course the rise of the psychedelic movement during the 1960s was still in the public consciousness at the time of publication and the popular sector of the movement was the target audience of this book. In fact the psychedelic arts had already been on the Alice trip; Jefferson Airplane’s famous song White Rabbit, for example. Is there, however, any truth in Fensch’s claims that this is early psy-literature? And, what is it about the book that begs the psychedelic analysis in the first place? “Critics who would claim that Lewis Carroll originally had no idea of hallucinogenic chemicals may be mistaken in their interpretation of his personality. There is little reason why Carroll’s creative vision could not have included instinctively, what are now referred to as mind-bending drugs” (Fensch 12). The question of whether Lewis Carroll was a secret tripper has been tackled more comprehensively since the publication of Alice in Acidland; most notably by Mike Jay in Emperors of Dreams (2000) – in fact in the latest edition of the book (2011), the question of Carroll, drugs and Alice has been slightly expanded upon. To summarise, it seems likely that Carroll took the motif of growing smaller and larger from the book The Seven Sisters of Sleep (1860) by Mordecai Cooke, which described Siberian shamans using the Fly agaric mushroom. No evidence has come to light that confirms Carroll ever tripped himself however. So what was it that Fensch was trying to do with the book in 1970? Fensch’s analysis is rather naïve. Small comments are interjected into the text where he thinks Carroll is making psychedelically tempered references – almost 100 years before the word had even come into existence. For example, any mention of grass is immediately associated with cannabis, anything non-sensical is ‘psychedelic’; or he simply recommends replacing words, like on page 54 when “Alice began fancying the sort of thing that would happen”, Fensch writes that it would be better understood as Alice began “hallucinating” what might happen. Hardly rocket science, and clearly aimed at a popular market. There is little or no value in this book today. This retrospective reading tells us nothing of a historical Carroll and even at face-value Fensch’s analysis is poor, supposing more than it analyses. Only in communicating to us the manner in which the late 1960s understood the book as a metaphor does it retain any use, and only then as a cultural curiosity. Next story Is San Pedro a “Miracle Healer”?